Q. Why USC? A. It’s a great program, and I’m going to be coached by a great linebackers coach in [Ken Norton Jr]. He is one of the best to play the game. I’m going to learn how to play football at the next level. And being able to play under coach Pete Carroll is an excellent opportunity. I know they will be able to improve my chances of getting into the NFL, which has always been my dream. It’s every kid’s dream who plays football. Q. What happened with UGA? A. I just didn’t want to be that close to home. I’m very thankful to UGA for offering me a scholarship and spending so much time with me. It was hard to tell them no because the coaches and I developed a great relationship. It got to a point where we didn’t even talk recruiting. 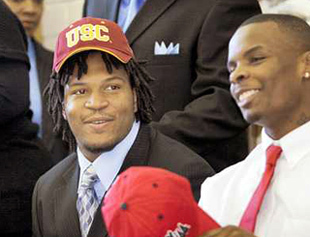 We would just laugh about other stuff, but I knew I couldn’t go wrong at USC. Sounds a lot like Kyle Moore back in his recruitment.